...Pastor's Wife Appreciation Plaque, Pastor Appreciation Bulletin, Pastor Appreciation Bible Verses, Pastor Appreciation Love Offering Letter (sample), Pastor Appreciation Month Activities Calendars, Pastor Appreciation Cards (on right), Pastor Appreciation Month Guidelines, Sample News Release for Pastor Appreciation Month, & Much More! Click here for Pastor Appreciation Bulletins and Great Gift Ideas for Your Pastor(s) at ChristianBook.com! Need a banner to help you celebrate Pastor Appreciation Month? If yes, Click here to download the free "October Pastor Appreciation Month" Banner! Want Pastor Appreciation Banners that spells out a Love Note from your church children to their Pastor(s)? If yes, Click here to download the free "We Thank God Every Time We Think of You! Philippians 1:3" Banners! Pastor Appreciation ideas are sometimes hard to find. You can find a beautiful poem below "Honoring God's Anointed". You can also find the Pastor Appreciation Month letter that you can send to your congregation before you have your special service to get a special love offering for your Pastors and their families, and also a sample news release for your local paper inviting your community to attend the Pastor Appreciation Month Celebration. I have also included guidelines for Pastor Appreciation Month. Pastor Appreciation Month is a special time that congregations set aside each year to honor their Pastors and Pastoral families for their hard work, sacrificial dedication and multiple blessings provided by these special people. It is typically scheduled in October, but can be held any time that is convenient for the church and the community. Let us please remember that appreciation, affirmation and prayer support of our spiritual leaders is appropriate throughout the entire year. There are lots of great gifts we can give them as you have seen on this page. Pastor's matching mugs are below at a very reasonable price - check them out. God has entrusted Pastors with one of the most precious of assignments, the spiritual well-being of his flock. They are the shepherd of our souls. Pastors and their families live under extreme pressures. Their lives are played out in a fish bowl with entire congregation and community watching their every move. People expect them to be perfect, always be readily available, to never be down, and to have all the answers we need to keep our own lives stable and moving forward. Those are unrealistic expectations to place on anyone, yet most of us are disappointed when a Pastor becomes overwhelmed, lets us down or completely burns out. That’s why God has instructed us to recognize his servants. Pastor Appreciation Month is just one of many ways to recognize and show our Pastors and their families that we appreciate all their hard work. A Full Scale Plan of Recognition might include a banquet, a special ceremony during a worship service, special guests or speakers, a church family reunion of present and former members, gifts, plaques, flowers or open letter of appreciation in the local newspaper. A more casual approach might simply involve a moment of recognition during a morning service. Click Here for Free Pastor Appreciation Month Bulletin. Plan a Daily Celebration Throughout the Month with each church member (depending on number of congregation) bringing something special to the pastoral family whether it be simply a Pastor Appreciation card, dessert, meal, money, or however they want to express their gratitude and love. 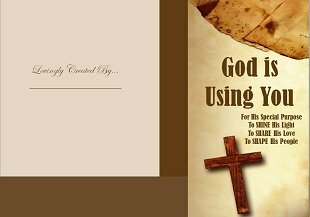 Click Here for Free Pastor Appreciation Cards. Acts of Kindness for Pastor(s) - Wash the Pastor's car, cook them a meal, mow his lawn or any other activity that your Pastor(s) would love to have done throughout the month of October. Click Here for the Free Pastor Appreciation Month October Calendars ready for your church members to fill in their name under the date in which activity they will do. Present Pastor with a Plaque (below) and Present His Wife with a Plaque (below) - Just simply download and print and insert them into beautiful wooden frames. Plan an Evening Bonfire Celebration with the theme of church unity. Share the joys and sorrows you have experienced together, especially identifying the role your pastor and his family have played. Make it a time of recommitment and bonding for your entire church family. Send Pastor Encouraging Letters - On Sunday before Pastor Appreciation Day, hand out stamped envelopes addressed to the Pastor to each church member. Attach a letter (sample below) to the self-stamped envelope inviting them to write to write and mail a personal note of encouragement and appreciation to the Pastor that week. A hand-written note conveys so much to a Pastor letting them know how much you appreciate them and that you are praying for them. These kind of gifts don't cost much of nothing but is well treasured for many years. Pastor Appreciation Scriptures - Click the link below for three pages of Bible verses for Pastor Appreciation Month ideas to insert in everything from cards to plaques or even just to read during your special church service. Urge the Sunday School and Other Children’s Groups to Make Creative Appreciation Messages for the pastoral staff using construction paper and bright colors. Have the pastor(s) visit them for their own ceremonies of gratitude or present them after church service. Then decorate staff offices with the children’s artwork. You can show your Pastor(s) how much you appreciate and love them without having to spend more money than you have. Click the link below for more Pastor Appreciation Ideas. Click Here for More Pastor Appreciation Month Ideas. Be creative and enjoy showing your appreciation for your pastoral staff throughout the month of October. Pastor Appreciation Poem - "Honoring God's Anointed"
Return to Home Page from Pastor Appreciation Ideas.